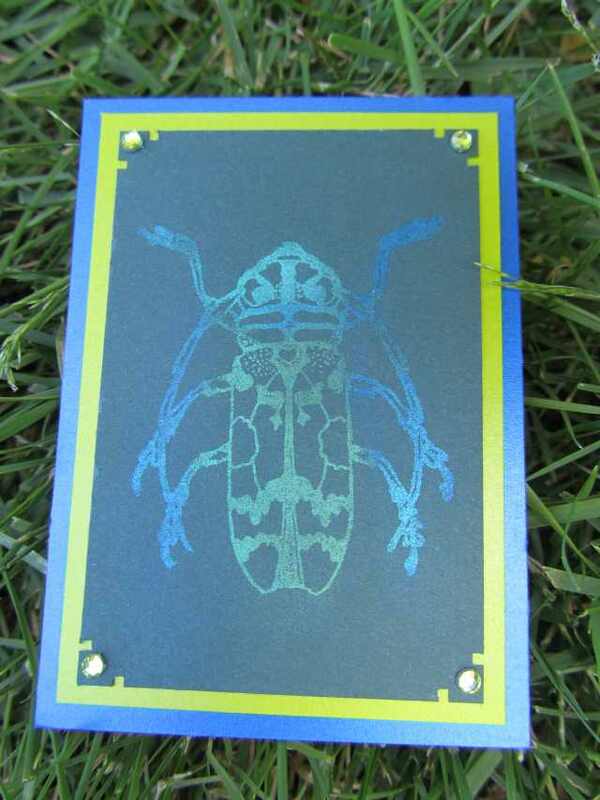 I made a set of 10 of these trading cards to exchange with my Craft Stamper group. 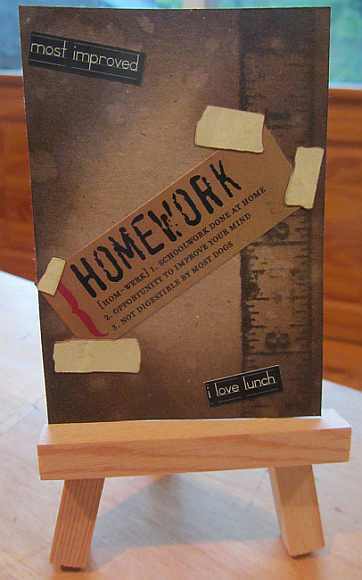 We meet monthly and exchange ATCs and ideas from things we learn from Craft Stamper magazine. This design was inspired by an Andy Warhol technique featured in the November 2013 issue. I used Ranger Distress Inks and Perfect Pearls mists to create the background. 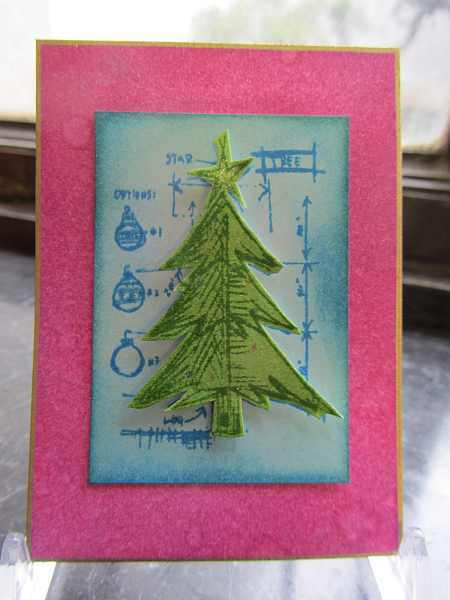 I then stamped the tree in the same color as I applied to the background, and made a metallic gold border around the edge of the cards with a Krylon gold pen. I inked and stamped another tree image in Mowed Lawn green, cut it out and popped it up with dimensional adhesive to give the tree some visual interest. Finally, I added accents on the tree with Sakura Jelly Roll pens. Thanks for visiting today. 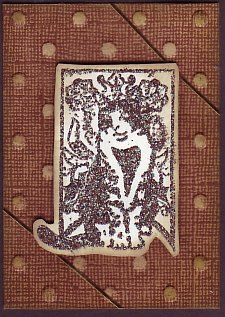 I made this spooky little ATC after being inspired by “Zentangle-style Doodles” article in the November 2012 issue of Craft Stamper magazine. The article is written and projects created by artist Lisa Mason and opened up a little bit of a different creative outlet! 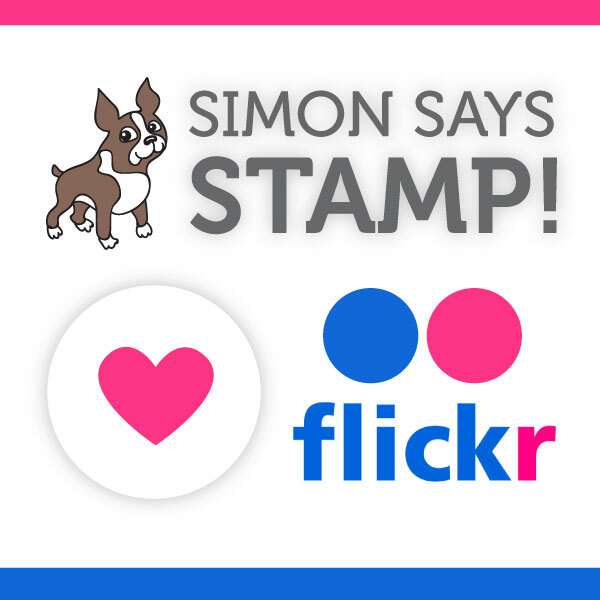 It shows how to use your stamps as a starting point and doodling around the image for a whole new look. So for this one, I used an opaque white pen to doodle on the Kraft paper, then I added outlines to the pumpkin and cat’s eyes with Sakura Sparkle pens. The challenge today, Day 237 at 365 Cards, is Spooky. So this fits the bill, even though this Paula Best stamp is pretty cute, while being spooky! Thanks for visiting today. This was a fun challenge that made me dig into my stash of supplies! The 365 Cards Day 227 Challenge is to make an Artist Trading Card (ATC) with a school theme. I’ve had the ruler stamp for years, and with its distressed look it begged to be stamped with Distress inks and spattered with a bit of water. The stickers again have been in my stash for years as well! I need to do more with all of the stickers I own! Great challenge! Thanks for visiting. 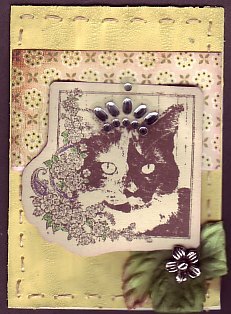 I made 10 of these ATCs to exchange in my Vamp Stamp News book club. We were following the January 2012 issue of the magazine, which covered many topics including Distress Inks and Goosebumps. Spraying the Goosebumps on the paper and then applying the inks over it made both an interesting texture (shiny and bumpy!) and it forms a resist to the water soluble ink. Scarab – stamped with Perfect Medium and then “painted” with Perfect Pearls: Turquoise, Forever Blue, and Forever Green. 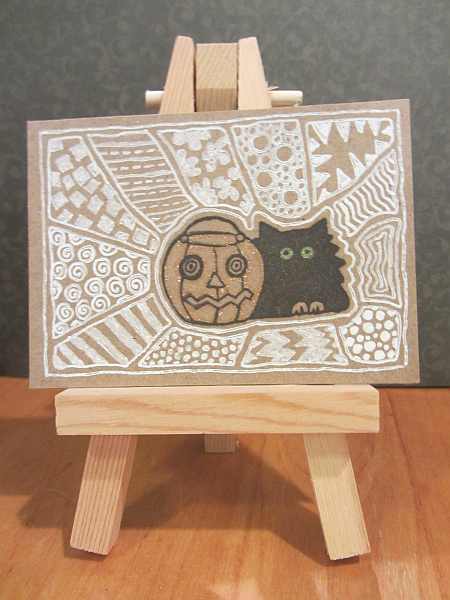 This is one from the set of 12 Artist Trading Cards I made (all the same) to trade with a stamp group the other night. The Perfect Pearls have a very nice sheen–perfect for the bug, and the paper is pearlescent too! Not sure how clearly you can see the sheen in the photo. Thanks for checking-in. 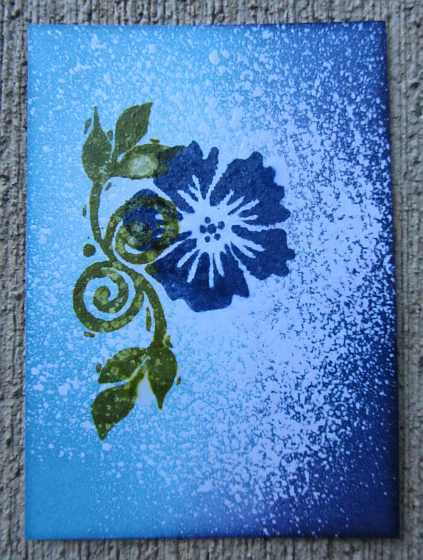 Background – Tim Holtz Distress Crackle Paint – Shabby Shutters. Leaves – Prima Marketing, Inc. Little brass flower added (origin unknown). Hand stitched border on card. Image popped up and coloring of the flowers around image done with Gelly Roll sparkle pens.